a Jaquard loom weaves New Zealand wool and American cotton to create blankets. a dobby loom creates cloth that is indistinguishable from hand-woven fabric. O’Bryan’s sewing company creates pillow shams and blankets, which are sold in small retail shops in Florida, North Carolina, Tennessee, and Virginia. Knudson and Michelson built a trusted team through empowerment. Each member, no matter his or her title, has the authority to make a call on quality control. Top, Phyllis Bonham checks the tension of the threads as she creates the warp. Today, the mill is home to five operating Jacquard looms, two dobby machines, and five automated hand looms, all used to produce high-quality, sustainable fabrics from Egyptian pima cotton, bamboo, linen, mohair, silk, and wool. Damask fabrics are used to make coverlets and shams. Artistic Director Bethanne Knudson, Director of Education Kelly Hopkin, Western Carolina Sewing Company owner Libby O’Bryan, and Bonham wear aprons made at the mill in Hendersonville. Kelly Gassert, O’Bryan, and Knudson in the Western Carolina Sewing Company room. 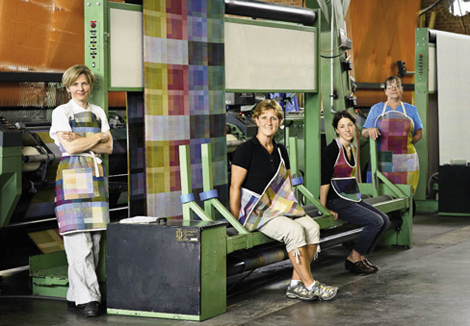 Knudson’s designs, such as the reversible color-block pattern, are the foundation of the mill’s products. Overhauler Barry Connor (below) knows the machines inside and out, diagnosing and fixing problems to keep the looms running. Warp and weft are the core words of a weaver’s language, forming the cadence of their work. The warp yarn runs vertical, top to bottom, on cloth. design is dependent on a warper’s precision. With the touch of her fingers, Phyllis Bonham can tell if the multicolored threads feeding through her warping machine are at exactly the right tension, a warper’s primary job. Bonham does this with the skill of a master. Before the weaving begins, the warp must be created by winding as many as 12,000 strands of yarn onto a giant spool­—or warp, in industry terms. This size warp can take Bonham two days to make, so her eyes are ever on the look-out for breakages in the yarn, which require skilled hands to tie. A textile veteran of 40 plus years, she’s one of five employees at The Oriole Mill, a small-scale textile venture in Hendersonville that was started in 2006 by Bethanne Knudson and Stephan Michelson. When most mills were selling off machines and shutting their doors, the duo proceeded with a plan to “reimagine,” as Michelson puts it, the industry model. The vision included empowering skilled workers, taking pride in quality products, and erasing the line between the art of textiles and the industry of textiles. In 1996, there were 2,153 textile and apparel plants in North Carolina, according to research by Duke University. By 2006, there were just 1,282, leaving 150,000 people without jobs. Western North Carolina was not excluded from this mass upheaval. Just one example is Beacon Manufacturing. The plant moved to Swannanoa in 1925, establishing itself as a part of the town’s history. Jobs were provided (2,200 at its peak), a mill village sprung up, and other industries followed the plant into the valley. The community named its high school in honor of Beacon’s owner, Charles D. Owen. Then, in the early ’80s, Beacon changed hands and was purchased by National Distillery, and then again by Pillowtex in the early ’90s, which began sending more production jobs overseas. By early 2000, Beacon employed fewer than 200 people. The business filed for bankruptcy in 2002, and closed the following year, ending a way of life for many in the community. Knudson and Michelson have strong opinions about how production was traditionally handled in textile mills, citing a shift in the early ’80s, when quantity took precedence over quality. Managers with MBAs, but no industry experience, began to consider workers simply part of the bottom line. At Oriole, they feel they have an opportunity to change that, giving workers flexible hours, paid holidays, cross-training, and most importantly, a voice. His job, she explains, is to keep the machines humming. He can diagnose a problem, take apart any of the complex looms, and put them back together again. Conner describes it as the “ability to see the machine, every component of it, in my mind’s eye, and understand how it fits together and how it runs.” With such expensive machines, having the right overhauler is essential. Dr. Nancy Cassill, professor and department head of textiles and apparel at North Carolina State University’s College of Textiles in Raleigh, remarks that what Knudson and Michelson are doing—finding a niche market to serve—is a trend among small textile manufacturing mills in the state. For Oriole, that market is supplying independent retailers with heirloom-quality products, working directly with interior designers, and selling wares via the company’s website. The mill focuses on shorter runs of fine fabrics, and produces artisanal products like natural fiber coverlets, shams, and throws using Knudson’s designs. This style of business is more intensive than just running yards and yards of the same pattern; it keeps the focus on quality goods. The idea is working. Combining quality, beauty, and practicality, the mill produces articles such as a matelassé coverlet, a machine-washable product that has New Zealand wool woven between two Egyptian cotton layers, creating a felted batting, and giving the coverlet a quilted look. The combination of yarn, weave structure, and finishing processes produces this look, while the wool gives it more insulation. So what looks like intricate sewing is actually weaving. Cassill also confirms that Oriole Mill isn’t the only changing face in textiles. More companies are focusing on pre- and post-production—research and development, design, marketing, and branding—now that production jobs are primarily overseas. Nancy Lester, data analyst for the North Carolina Department of Commerce reports there are currently 1,105 textile and apparel companies in the state employing 47,600 workers. The enrollment at N.C. State’s textile school is growing, too, and Cassill says, “The students aren’t all from China,” a common assumption of parents of prospective attendees. In fact, 90 percent of enrollment is students from the United States. While enrollment rises at N.C. State’s School of Textiles, the Jacquard Center, a teaching facility in Hendersonville founded by Knudson and Michelson in 2000, is linking art and industry through education. Before coming to Hendersonville, Knudson worked in technical support for the computer software, JacqCAD MASTER, which designers use to program Jacquard looms. She traveled extensively to train designers in the industry. Now students come to the center from all over the globe. Some are artists who exhibit their work worldwide, while others are industry folk who return to their manufacturing jobs inspired to make new products. The center, just three miles from the mill, is the only one outside of a university setting that combines training in design with experience on the looms. Using the mill’s machines is a rare opportunity, considering that in the past, mills were leery of shutting down production to allow training on costly equipment. “But it is at the loom that the students learns if their designs work or not,” Knudson says. Time on the Jacquard looms is particularly valued. The machines have the distinction of lifting one thread of the warp at a time, allowing for intricate, complex, and raised designs, such as brocade, damask, and matelassé. What would take a hand weaver two hours to create, the Jacquard machine can do in a matter of minutes. The learning environment has earned the mill a reputation in the art world. One of the people who took notice was Libby O’Bryan, who was studying at the School of the Art Institute of Chicago when she heard about Oriole Mill. Today, O’Bryan is the owner of Western Carolina Sewing Company, a cut-and-sew production business located inside the mill. She says the blend of art and production, “makes every weaver want to come here.” Her business is another example of Michelson and Knudson’s desire to share information while growing and redefining the textile industry. They provide workspace for her, and she produces a finished product, finding inspiration in the fabrics to create pillows, scarves, throws, and other items. She also teams up with Knudson to design market bags, beach totes, laptop sleeves, pet products, and kitchen items, including a reversible apron that Knudson is particularly excited about. O’Bryan is also part of the company’s way of closing the production loop. As more and more ancillary textile businesses shut down, there’s a need for this operation to be more independent. In 2008, three dye houses the mill depended on closed. Now, the mill aims to do the dying, since there is a dye house in the basement of the factory. “All we need now is a chemist,” Michelson jokes.